From left: Linda Grandolfo, Sue Shutrump and Lisa Nippolt of award sponsor Q’Straint/Sure-Lok. Three weeks after receiving the Peter J. Grandolfo Memorial Award of Excellence at the STN EXPO in Reno, Nevada, for her service to students with disabilities, Sue Shutrump still can’t believe it. 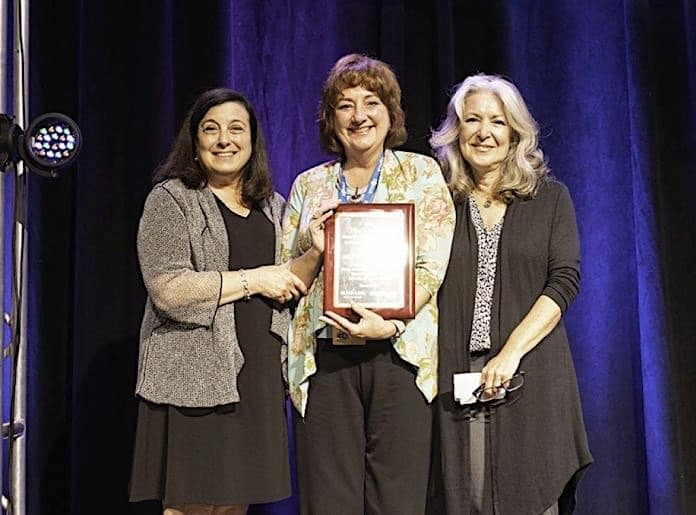 The supervisor of occupational and physical therapy for Trumbull County Educational Service Center in Warren, Ohio, was honored on July 15 during the opening general session at the Peppermill Resort Casino Spa. She’s not new to receiving awards, having won the 2007 National Association for Pupil Transportation Special Needs Award, which like the Grandolfo Award, is sponsored by wheelchair securement provider Q’Straint/Sure-Lok. But the Grandolfo Award, which was first given in 2007, has an even more special place in Shutrump’s heart, because of the man it’s named after. The former NAPT board member and director of transportation for Chicago Public Schools was dedicated to the special needs transportation community, the students it serves and to training. Shutrump pointed out that Grandolfo would “invigorate” NAPT Special Needs Committee members by advocating for needed guidance and research for the transportation of both students with disabilities and preschoolers. These efforts, Shutrump added, culminated in the WC 19 standard for wheelchairs that are crash-tested as passenger seats in school buses, and the National Highway Traffic Safety Administration’s Child Safety Restraint Systems (CSRS) on School Buses course, part of the 40-hour certified child passenger safety technician training. Shutrump, herself, is a certified CPST instructor, leading the training teams at the STN EXPO and the TSD Conference. She served on the NHTSA CSRS on school buses curriculum writing committee, on both revision committees and was a consultant on NHTSA’s training video series. She has also presented numerous seminars and authored articles in many publications, as well as a chapter, “Best Practices in Safe Transportation” in the American Occupational Therapists Association textbook, Best Practices for Occupational Therapy in Schools. Shutrump also thanked Linda Grandolfo, Peter’s widow, as well as sponsor Q’Straint/Sure-Lok. Shutrump said acting as a resource and advocate for school bus drivers and transport support staff who serve students with disabilities, despite often receiving little support or information from their school districts, is what she has enjoyed most in her career.